Did you know that missing teeth can contribute to the appearance of premature aging? Since losing dentitions also means you lose bone tissue, too, this can cause your jaw to decrease in density and make the lower portion of your face look “sunken” – making you look older than you are – and who wants that? Regardless of your actual age, dental implants in Temple can restore not only the youthful aesthetic of your grin, but also the functionality of your teeth, too. Learn more about the beauty of this restorative option from the trusted team at Fossum Dental Group. Implant Post – The actual implant itself is a biocompatible titanium post that will be placed in your jaw during minor oral surgery. After about 3-6 months, your natural jawbone will fuse with the post through a process called “osseointegration,” making it strong enough to support the other pieces of the artificial tooth. Abutment – This is the connecting piece that links the implant post to the portion of the implant that looks and functions just like your original teeth. Although its job is important, this piece will be hidden under your dental crown. 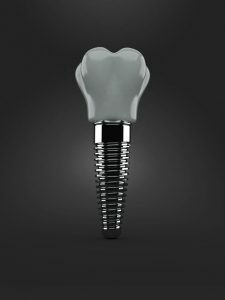 Dental Crown – This is the part of the implant that resides above the gum line. It’s a tooth-shaped cap that is generally made of porcelain for teeth in the front of the mouth, or a porcelain-metal combination for extra durability when replacing teeth in the back of the mouth. The abutment and crown will be added at the same visit, and you’ll be ready to start showing off your improved grin after this visit. They improve the density of your jawbone. They stay in place and won’t wiggle when you chew, speak, or even kiss your sweetheart. They’re remarkably cost effective and less expensive than dentures over the long-term. They require no adjustment time – you won’t have to get used to them like dentures or partials. You have tooth loss, but your remaining teeth and gums are healthy. You are dedicated to taking good care of your teeth. You don’t suffer from uncontrolled diabetes or other immune conditions that prevent your body from healing. You’re a non-smoker, or are committed to quitting and can avoid tobacco throughout the dental process. You understand that the entire process generally takes at least 3-6 months. **If your jaw isn’t dense enough initially, you could still be a great candidate after undergoing bone grafting. So, if you’re ready to bring back the winning grin you once knew, schedule an appointment with Fossum Dental Group today!